Figure A. RPE conjugated mouse anti bovine CD32 (MCA5918PE) and FITC conjugated mouse IgG1 isotype control (MCA928F). Figure B. RPE conjugated mouse anti bovine CD32 (MCA5918PE) and FITC conjugated mouse anti bovine CD40 (MCA2431F). All experiments performed on red cell lysed bovine blood gated on lymphocytes. Data acquired on the ZE5™ Cell Analyzer. 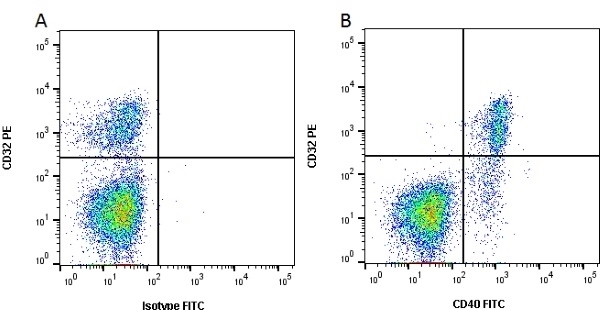 Effect of free Mmm galactan on surface expression of CD40 ( A ) and CD80 ( B ) on bovine macrophages. Cells were incubated for 48 h with galactan (EPS) at 0.1, 1 and 10 μg/ml, or with LPS and medium only (C−) as positive and negative controls respectively. 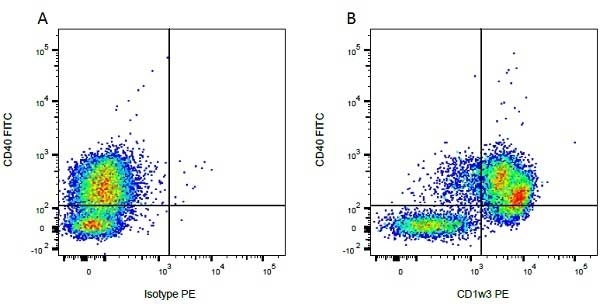 Cell-surface expression of CD40/CD80 was measured by flow cytometry and results expressed as mean (±SD) percentages of positive cells for a given marker (n = 3). Asterisks indicate statistically significant differences (p < 0.05) with the negative control. From: Totté P, Puech C, Rodrigues V, Bertin C, Manso-Silvan L, Thiaucourt F.
Free exopolysaccharide from Mycoplasma mycoides subsp. mycoides possesses anti-inflammatory properties. Vet Res. 2015 Oct 21;46(1):122. 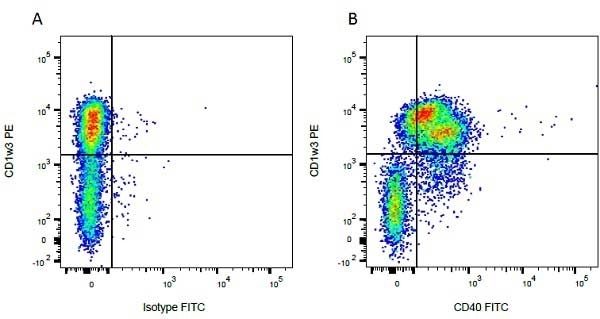 Mouse anti Bovine CD40 antibody, clone IL-A156 recognizes the bovine CD40 cell surface antigen, which is expressed by B lymphocytes and a subset of T lymphocytes. CD40 plays an important role in the differentiation of B lymphocytes into effector cells, and is also involved in interactions between T and B lymphocytes. 1 Clone IL-A156 is reported to function in in vivo applications, see Haas, K. et al. for details. Removal of sodium azide is recommended prior to use in functional assays – Bio-Rad recommend the use of EQU003 for this purpose. Langelaar, M.F. et al. (2005) Mycobacterium avium ssp. paratuberculosis recombinant heat shock protein 70 interaction with different bovine antigen-presenting cells. Scand J Immunol. 61 (3): 242-50. Epardaud, M. et al. (2004) Enrichment for a CD26hi SIRP- subset in lymph dendritic cells from the upper aero-digestive tract. J Leukoc Biol. 76 (3): 553-61. Glew, E.J. et al. (2003) Differential effects of bovine viral diarrhoea virus on monocytes and dendritic cells. J Gen Virol. 84 (Pt 7): 1771-80. Norimatsu, M. et al. (2003) Differential response of bovine monocyte-derived macrophages and dendritic cells to infection with Salmonella typhimurium in a low-dose model in vitro. Haas, K.M. et al. (2001) Enhancing effects of anti-CD40 treatment on the immune response of SCID-bovine mice to Trypanosoma congolense infection. J Leukoc Biol. 70: 931-40. Totté, P. et al. 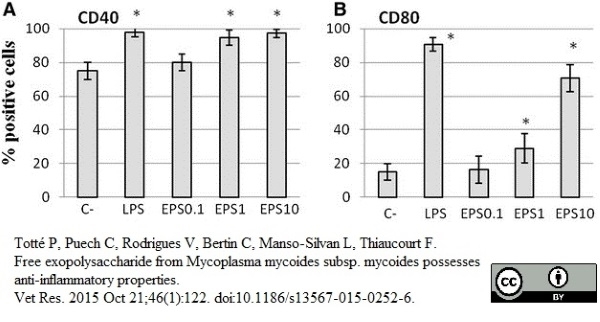 (2015) Free exopolysaccharide from Mycoplasma mycoides subsp. mycoides possesses anti-inflammatory properties. Vet Res. 46 (1): 122.